6 days gorillas, golden monkeys and wildlife safari | 6 Days Uganda tour | 6 days Safari Holiday. 6 Days Murchison Falls, Kibale, Queen Elizabeth Parks Tour. 1 days Jinja City Tour. 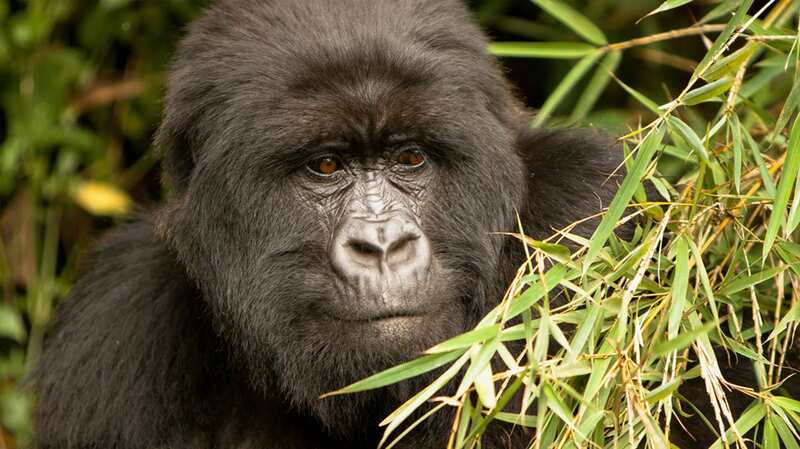 3 days Gorilla safari Rwanda. 12 Days Uganda bird watching safari. 2 Days Jinja Nile Biking Trip. 7 Days Uganda golf, gorilla and wildlife safari. Corporate social responsibility of AA Safaris and tours. Visit one of the less populated parks in Uganda during our 6 days gorillas, golden monkeys, and wildlife safari. The 6 days Uganda safari takes you to visit lake Mburo national park and Mgahinga national park to see wildlife, trek gorillas and golden monkeys and to also hike Mt Muhavura or Sabyinyo. Day 1: To Mgahinga national park. Day 3: Gorilla trekking and Batwa experience. Early morning, transfer into the park’s forests to track Mgahinga’s mountain gorillas and once you have located them, you will spend up to an hour watching these magnificent gentle giants feeding, playing and relaxing in the trees as you take multiple photos of the apes. Return for lunch at the lunch. In the afternoon, you will go to the Batwa community to learn about the lives of the indigenous Batwa people. The local guide will take you through the 8km gentle trail in Mgahinga Gorilla National Park, demonstrating their traditional ways of life along the way, including gathering honey, hunting, fetching water, making fire and a moving performance in the Garama Cave, an important spiritual and cultural site for the Batwa. Day 3 ; Golden monkey trek. / Boat ride Lake Mutanda. In the morning right after breakfast, you will go trek golden monkeys in Mgahinga national park. The trek will will take you through the bamboo forests in search for the rare golden monkeys in the forest. You will see the spectacular vegetation and scenery on your way. Later in the afternoon, you may go for a boat ride on Lake Mutanda. Day 4; Summit a volcano | Mountain Hike. Day 5; Transfer to Lake Mburo park. Early morning after breakfast, transfer to Lake Mburo National Park and drive through the savannah with evergreen state of Africa and the kigezi highlands. Check in at the lodge, have lunch and prepare for a game drive later. After breakfast, prepare to check out of the lodge for your return back to Kampala. This will be the end of your safari! Note; This tour can start or end in either Kigali Rwanda or Kampala, Uganda. We are a Premier tour company based in Uganda, offering Gorillas and wildlife safaris in Uganda and Rwanda. With over 10 years of experience and professional staff, contact us to plan your next adventure safari to Africa!